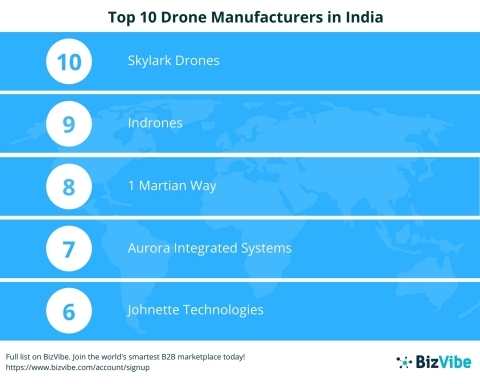 LONDON--(BUSINESS WIRE)--BizVibe, a smart business networking platform for global B2B buyers and suppliers, announced today their list of the top 10 leading drone manufacturers in India. 10. Skylark Drones - This company offers a Drones-as-a-Service (DaaS) model. Their solutions include mining projects, utilities and vertical infrastructures, which then collects the data found and processes and delivers it in a simplified and personalized way to the client. 9. Indrones - Indrones also offers a DaaS service model and also manufacturers drones for public use. The company was founded in 2013 and has made it their mission to revolutionize data collection through the power of autonomous aerial platforms. 8. 1 Martian Way - 1MW is one of the more successful drone manufacturers in India offering custom-made drones for sale. They also provide services like aerial photography, drone rentals, advertising with drones/aerial banners, robotics education for colleges and universities, robotic apps for industrial solutions and experiential branding and gaming products. 7. Aurora Integrated Systems - This company is supported by one of India’s largest and most respected business conglomerates, Tata Group. AIS’s product line includes short-range Small Unmanned Air Vehicles (SUAV) to long-range tactical systems, rapidly deployable aerostat systems and technologies in inertial navigation. 6. Johnette Technologies - Johnette is another highly successful drone manufacturer in India. Founded in 2010, the company has since then been a pioneer in developing high-quality unmanned system technologies. Their aerospace systems are often sold for paramilitary, commercial, aerospace and defense sector purposes. BizVibe’s job is to connect buyers and suppliers from all over the world with the goal of helping B2B companies keep up with market demand. In addition to the top companies from India’s drone manufacturing industry, BizVibe is also home to more than 7 million companies overall. Let new clients come to you. Add your company and get introduced to leading global drone manufacturers on the world's leading business networking platform. For all your product sourcing and supplier needs, join BizVibe for free. BizVibe has been specifically designed to help industry professionals connect with like-minded businesses by providing them with a simple and seamless platform. Through cutting-edge technology and advanced match-making algorithms, BizVibe has created something that can truly help companies find the right partners. Our users call it the smartest networking platform on the planet. BizVibe is able to identify the core problems and uncertainties when finding potential trade partners through the extensive feedback given by communities across multiple industries. Using this feedback, BizVibe developed an efficient networking platform dedicated to buyers, sellers, importers, exporters, manufacturers, and suppliers. Our goal of helping thousands of users connect, engage, and make business deals daily has been wildly successful. The exclusive focus of BizVibe’s platform is to make networking easier. Through many years of experience and trial-and-error, BizVibe’s experts have discovered how to seamlessly connect international companies and enable trade. We get it. The first interaction can be heavy with the uncertainty of finding a potential partner vs. a potential nightmare. With this in mind, we’ve designed an online B2B platform that includes a robust set of tools to help companies generate leads, shortlist prospects, network, and trade seamlessly with businesses from around the world. BizVibe Announces Their List of the Top 10 Drone Manufacturers in India.